You are enjoying the day, strolling through a commercial property, when you suddenly trip on a jagged piece of linoleum that was not secured to the flooring; you crash to the ground, incurring several fractures. The medical bills are piling up, you are missing numerous days from your job, and you find yourself sinking into a depression as problems escalate all around you. It may be time to enlist the services of an experienced personal injury attorney now. If your accident occurred due to negligence on the premises, the owner may be liable. The law considers what “reasonable” care would be, and whether or not the property owner or occupier should have done more to keep the area safe. Other considerations include your own carelessness and conduct. Was your behavior reasonable? Did you have a rational purpose for being where you were? Or did your lack of focus or your ill-conceived intrusion into a dangerous location contribute to the accident? When considering whether or not to pursue a legal remedy, consider the fact that there is a firm four-year time limit with regard to legal action in Florida for your personal injury if it occurred on private or commercial property. This filing deadline also applies to any property damage that may have occurred related to the accident, such as breaking your camera during a fall. In the event of a fatality, the statute of limitations is two years from the time of death, assuming the death occurred later than the accident itself. One in twenty falls result in a fracture. Three-fifths of falls occur on the same level. The most serious fracture from a fall is a hip fracture, which frequently leads to additional health issues and sometimes even death. One-third of individuals over the age of 65 will experience a fall every year. In 2005, there were 15,000 deaths from falls involving people over the age of 65. 8 million individuals who were treated for a fall in an emergency room were over the age of 65. Four out of every ten admissions to a nursing home are related to falls. About one-fifth of slip or fall accidents result in a mean of 31 days of missed work. 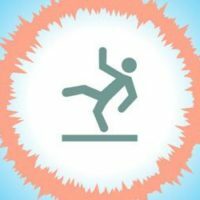 Employee slip and fall accidents account for roughly $70 billion in medical costs and lost compensation every year. If you experience a slip or fall accident due to negligence that lands you in the hospital, aggressive legal representation can help to meliorate the financial and emotional effects. Contact the experienced team at the Law Offices of Robert W. Elton for a confidential, no-cost consultation. We can discuss your case at your hospital bedside if necessary.